ARRA News Service: Preparing for the 112 Congress: Will Democrats Finally Listen To The Message From The American People? Preparing for the 112 Congress: Will Democrats Finally Listen To The Message From The American People? Update 1/3/11 5:15 PM - Washington Post: House Republicans set Jan. 12 as the day to pass a repeal of President Obama’s health-care law. The Senate and House for the 112th Congress convenes on Wednesday, January 5th, 2011. 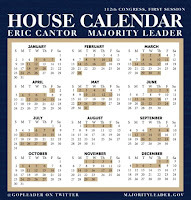 House Majority Leader-Elect Eric Cantor has introduced the 2011 Congressional Calendar for the House of Representatives. 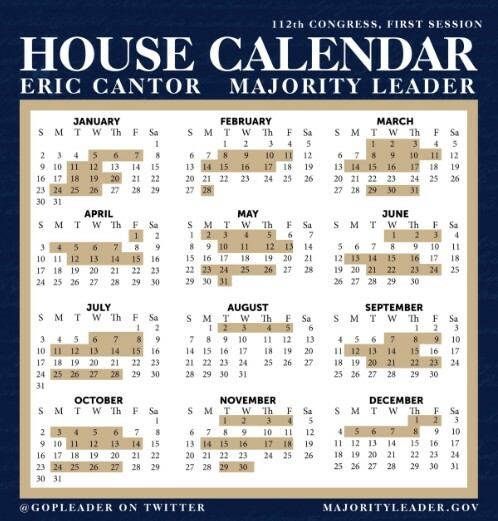 "This year's calendar is the result of substantial input gained by the Republican Transition Team from members of both the House Republican Conference and the House Democratic Caucus, and from many outside reformers. In total, it contains 123 days and 32 weeks of session. Please note that days in session are shaded dark." As the 112th Congress begins this week, the key question is whether President Obama and the Democrat majority in the Senate will listen to the clear message sent by the American people in November. While Republicans will be responding to the voice of the people in the US House, we are left with the question, what is going to happen in the US Senate still lead by Sen Harry Reid (D-NV). Will Senate Democrats finally acknowledge the message of voters on Election Day? Will they support Republican efforts to reduce spending? Will any Democrats join with Republicans to repeal and replace the unpopular health care law liberal leaders jammed through Congress last year? Will Democrats Finally Listen To The Message From The American People? Tags: Washington, D.C., 112 Congress, US Senate, US House, democrats, republicans, House calendar To share or post to your site, click on "Post Link". Please mention / link to the ARRA News Service. Thanks! No, however, the progressive left is now saying that job creation is job #1. Where were they the past 3 years when they controlled the House and Senate, ran up the deficit, and killed private sector jobs? Yeah, right. Four yrs ('07 thru 2010) of Dems controlling both houses of congress and suddenly they are going to worry about job creation, after all of the job killing bills that they have passed? Ya want job creation? Pass the FairTax Act H...R25/S296. The stimulus package for the taxpayers. It's not a Dem or Repub issue, it's a taxpayer issue!